For all drums lovers who enjoy drumming and everything related to it. 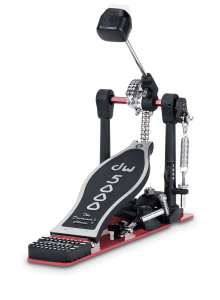 At first thought, it might be easy to write off any bass drum pedal as a simple combination of footboard and beater. After all, how many ways can there be to strike a kick drum? To those non-drummers out there, it probably seems as elemental as step on a pedal, make some noise. But there are many different pedals on the market, with various features to suit each individual’s taste. Of course there’s the obvious distinction between single and double pedals, but when you take a close look at each available option, you find a staggering amount of variation. Chain or belt drive? Single or double chain? 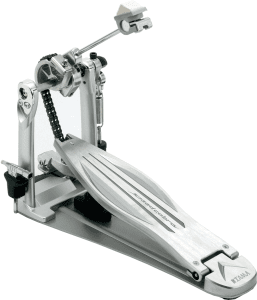 What about direct-drive pedals or longboards, in contrast to the standard split footboard? By the time you’ve finished this article, you’ll have the knowledge necessary to find the right pedal for your needs. When we talk about pedal drives, we’re describing the mechanism that connects the footboard to the beater, allowing the pedal to function. The three main types are chain, belt, and direct drive. Axis longboardFootboards can come in all shapes and sizes, but the most important distinction is between the standard footboard and the longboard version. Most pedals have a hinge by the player’s heel, providing a flat base at the end that does not take part in the playing action of the pedal. By contrast, longboard pedals lack that hinge, so the entire length of the footboard acts as a viable playing surface. The longboard style is particularly popular with drummers who utilize heel/toe or rocking techniques in an effort to facilitate rapid double strokes. Longboards can also give increased comfort to players with larger shoe sizes. Cams are the assemblies that attach the drive to the beater and supply the radius around which the drive will pull the beater in response to the footboard. The two types are linear and offset. Okamoto gives a very useful description and delineation of cams: “Linear cams maintain the same radius throughout the travel of the beater, and the beater speed is constant from the beginning to the end of the stroke. Direct-drive pedals and pedals with round cams are examples of linear-drive pedals. 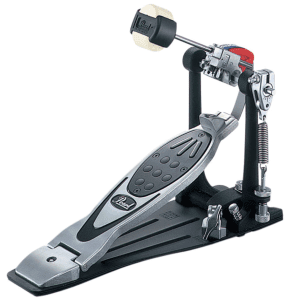 Like Pearl’s Eliminator, some other models aim to maximize the player’s range of choices via pedal customization. For example, DW’s 9000 series features an infinitely adjustable cam. This article gives only a glimpse at the range of variability within bass drum pedals, and ideas and opinions on the same features often differ among drummers. Are you daunted by complexity and customization and yearn for straightforward playability and the beauty of simplicity? 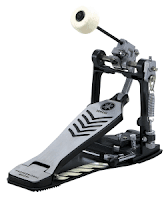 Perhaps you’ll agree with Jim Haler at Yamaha, who says, “I think some pedals have a lot of features that are more the ideas of engineers, not drummers. For every independent adjustment, that’s another screw that can be stripped, another place for dirt to accumulate, or another chance for a squeak or a rattle to occur. Rather than spending a lot of time fiddling with adjustments, I want to sit down at my kit and play. You can tweak the feel, but I like that our pedals are simple and well built, and they feel great out of the box so you don’t have to mess with them. But maybe you like to stay on the cutting edge of pedal technology. In that case you can look into Pearl’s Demon Drive, Tama’s Speed Cobra, or Axis’s A21 Laser pedals, to name a few. For the extra-adventurous there’s the unique symmetry of Sleishman’s double pedal or the many iterations of Duallist’s multi-beater pedals. Whatever the case, as long as you’re familiar with some of the basic concepts, you and your drumming clientele can find a world ripe with inspiration. The owner of drumswire.blogspot.com blog makes no representations as to the accuracy or completeness of any information on this site or found by following any link on this site and will not be liable for any errors or omissions in this information nor for the availability of this information. All content provided on drumswire.blogspot.com blog is used for documentation, knowledge, and sharing purpose only. Some materials are gathered from all around Internet. If ones should find their materials here and request them to be removed, please let me know. I will remove it immediately.